Why go hunting for cash at the ATM before you can book a ride? Just hop on and off your ride, hassle free by booking it with GrabPay. Register your credit/debit card today. 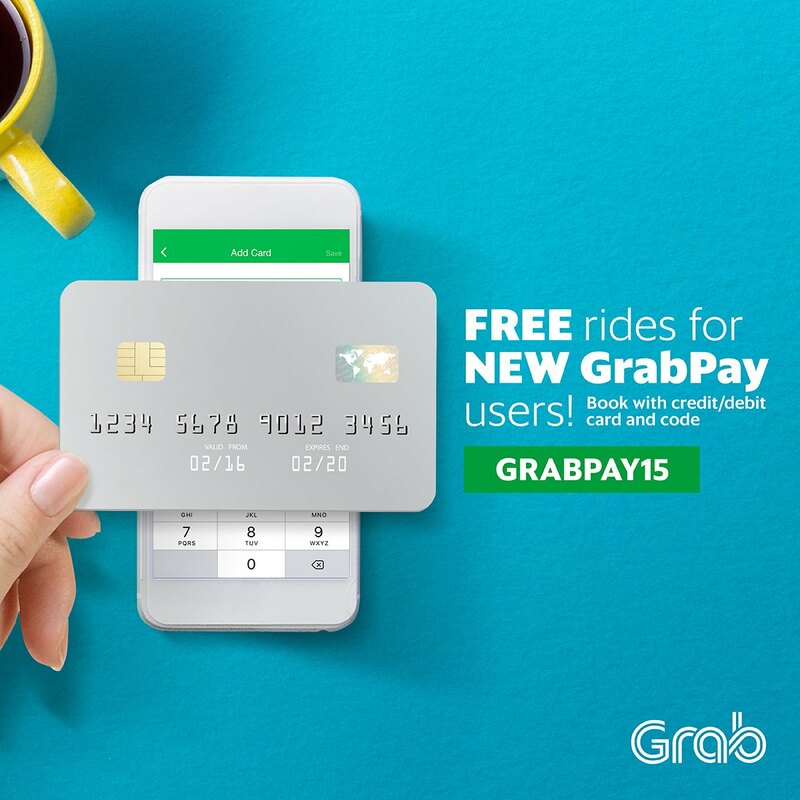 Use it to book a Grab ride with the Grab Malaysia promo code GRABPAY15 to enjoy up to RM15 off x 5 rides. This promo is only valid for new to GrabPay (credit/debit) card users. Try GrabPay on GrabCar, GrabShare or GrabTaxi - choice is yours. Still paying for your Grab rides with cash? Why not upgrade your experience by registering your credit/debit card with GrabPay? Thousands have done it and are now enjoying smoother rides. No more looking for an cash at the ATM or fumbling with crumpled bills and loose change. Just hop on and off your Grab ride, hassle free! Plus, until 31 March 2017, as a first-time GrabPay user, you can enjoy five FREE rides (up to RM15 each) when you book with your credit/debit card and the Grab Malaysia promo code GRABPAY15! This promo is valid nationwide. Whether you’d like to try your first GrabPay ride on GrabCar, GrabShare or GrabTaxi – it’s your choice! In order to be eligible for this promo, you MUST use the GRABPAY15 promo code on your FIRST GrabPay / cashless Grab ride. If you do not use the promo code on your first GrabPay / cashless ride, you are no longer eligible for the promo and it will be void. Payment Method: GrabPay (credit/debit card) only. Promo redemption: Valid for the first 50,000 redemption only. This promo is only eligible for Grab users who have never completed a GrabPay / cashless ride. In order to be eligible for this promo, you MUST use the GRABPAY promo code on your FIRST GrabPay / cashless Grab ride. If you do not use the promo code on your first GrabPay / cashless ride, you are no longer eligible for the promo and it will be void. Available for GrabPay (credit/debit card) only. This promo will expire on 31st March 2017 at 11.59PM or when promo redemption reaches 50,000; whichever occurs first. This promo is valid for all Grab services, except for GrabHitch or any special icon. How to register your debit/credit card on GrabPay? If you are registering a debit card, please call your bank first to inform them beforehand. Tap on the top left menu bar. Click on “Add Credit/Debit Card”. Key in your card info and click Save. Please contact your bank first if you are going to register your Debit card. Kindly take note that all card/debit card registration on GrabPay will incur a validation charge of RM1, which will be refunded back within 7–30 days depending on the card issuer bank. Terms and conditions apply. How to book a discounted ride using Grab promo code? Tap on any Grab service you’d like to book a ride on. Enter promo code GRABPAY15 and book your ride.